Own a Vita? Have a PlayStation Plus account? Good news: You're about to drown in a wealth of free games courtesy Sony. A few hours ago >we brought you word that Sony plans to offer a handful of new, free games for PlayStation Plus subscribers. 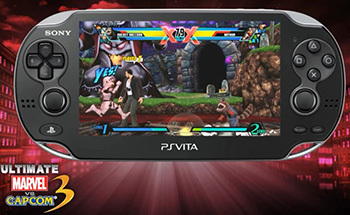 Those offerings include PlayStation 3 games like Spec Ops: The Line, Joe Danger 2: The Movie and The Cave, while the Vita will see gratis versions of Disgaea 3: Absence of Justice and Tekken 6. Great, right? Hold on to your butts, it's even better than you think. According to a new entry on the official PlayStation.blog, PS Vita owners will also be awarded an additional four titles initially released for the PSP and original PlayStation in celebration of the handheld's first anniversary. From March 5 until March 11, those of you who own a Vita and have a PlayStation Plus subscription will be able to download the excellent, yet largely overlooked PlayStation roleplaying game Wild Arms, as well as Patapon, Piyotama and Patchwork Heroes from the PSP. Thanks to the magic of emulation, each of these games works on the Vita, and offers largely the same experience that they did when they first debuted on their respective Sony platforms of origin. Oh, but that's not all. Jake, tell them what else they've won! Well Johnny, in addition to those free games, Sony has also discounted the price on a huge number of Vita titles. The full list is coming up in just a moment, but the key thing to remember is that each of these games has been marked down by a whopping 30 percent. Of course, that's just the standard discount for your ordinary, every day player. Those with PlayStation Plus subscriptions will see each of these games at half off their original price. Great news for those of you who hope to download these titles, as those proprietary Sony memory cards cost way, way more than they should. Finally, Sony has also just opted to discount three more games -- FIFA Soccer 13, Madden NFL 13 and Oddworld: Stranger's Wrath -- though these price cuts are less impressive than the ones I mentioned a moment ago. The first two titles will see a 30 percent price reduction, while that last one will only shed a quarter of its total cost -- and those figures are the same whether you have a PlayStation Plus subscription or not. While Sony obviously has no idea how to market or successfully back the Vita, that doesn't stop third party companies from releasing genuinely good games on the system. We don't expect the handheld to ever top Nintendo's 3DS, but while it languishes in undeserved obscurity you may as well reap the rewards and pick up a ton of games on the cheap. It's the least you can do.